A squadron of three vessels has been sent out from the Russian Navy’s fleet to combat piracy on the Easy African coast. The ships in this squadron are comprised of the oil tanker Irkut, the destroyer Marshall Shaposhnikov, and the rescue tugboat Alatau. The task force disembarked from the Pacific Fleet navy base in Vladivostok on Nov 2nd and headed for the Arabian Sea. During the voyage the squadron will be joining with the international naval anti-piracy force, made up of vessels from the United States, the European Union, China, South Korea, India and Iran. The Russian flotilla will be with them for three months before returning to Vladivostok, first making stop-overs at naval bases in the Seychelles, Thailand, and South Korea. This voyage makes Russia’s eighth squadron to be deployed for the international forces since the maritime and anti-piracy operations began three years before. It is also the second East African voyage for the Marshall Shaposhnikov, a BPK 543 Udaloy Class submarine destroyer, which remains one of the Russian Naval Pacific Fleets flagships, despite its 28 years of active service in the fleet. In 2010, while deployed on anti-piracy operations, navy commandos from the destroyer completed a number of missions. One such mission was the May 10th rescue of a ship and crew of the supertanker MV Moscow University, which was taken by Somali pirates and held captive on Socotra Island five days earlier. The Russian Navy has escorted more than 130 ships through the Red Sea, and other pirate infested waters off the African coast, since its first deployment with the international anti-piracy operation three years ago. During the Pacific Fleet squadrons journey to Africa, there are preparations being made by a Black Sea Fleet task unit for deployment. According to the Russian Defense Ministry the landing ship Saratov and the missile cruiser Moska were training in the Aegean Sea while a patrol vessel, the tugboat Smetlivy, will be joining the group. The task unit will also be joined by the landing ship Nococherkassk. 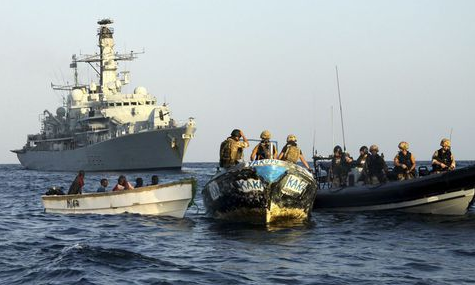 Pre-emptive actions against pirates, such as strikes against bases on the Somali coast, have been made by the international anti-piracy naval force. Armed guards are becoming more a more frequent addition with shipping firms, along with razor wire and heightened watches, for protection against pirates. This has led to a dramatic drop in piracy but pirate activity is still a problem. As of Oct 27th there have been 252 incidents of armed robbery and piracy, and another 26 of hijackings reported to the International Maritime Breau from around the world just this year. The Somali pirates have been found to be responsible for 13 of the hijackings with 212 hostages taken, and another 71 incidents or robbery and piracy. Currently they are holding 154 hostages and 9 vessels captive.